Comino Malta Cruises offers a variety of boat trips to Comino Blue Lagoon in one or more of the wonderful beaches surrounding the island. When is it best to visit Comino? What are the best cruises to take? How can I find the best cruises? These are some of the questions you will ask to yourself. It depends when you intend coming to Malta. In summer you find all the cruises you will wish to take. Read our information in these pages dedicated to various cruises and Captain Morgan where you surely can get a good picture of what is available. We bring you the cruises of various operator for a general ideal of what they offer. Useful information to help you prepare for your holiday in Malta. In summer all cruises are available but the Blue Lagoon is crammed with visitors. Lean periods between May and June are the best time to take advantage of a cruise. Although the sea is still cold in May, with June being somewhat warmer, however the air temperature is already warm. With less visitors you will be able to enjoy a more tranquil stay. This is certainly the case during late September and October when visitors are less numerous than May and June. Cruises are organised depending on the weather conditions. In early mid September, or also later on, it is very common to have some bad weather by way of wind and rain although this tends to be very short lived. Once the storm passes, the weather turns summery again to late October. By this time the sea temperature starts to becoming more fresh although it is still pleasant to sunbathe. There are mainly three cruise locations with Sliema waterfront, being the most popular, followed by Bugibba and Mellieha. The various ferries depart from Malta at Marfa and Cirkewwa and from Mgarr harbour in Gozo. Although there are several operators who offer this service, Captain Morgan is the undoubtedly the largest operator with various sizes and variety of boats. Operators departing from Sliema waterfront - longest trips to Comino 90 minutes. Bugibba – a much shorter distance. Cirkewwa and Marfa – location very close to each other just in front of Comino, 10 minutes by speed boat ferry. - It cruises along St. Paul´s Island, where St. Paul was shipwrecked in 60 A.D. then Mgiebah Bay and Mellieha. - Then we pass by Smugglers´ Cove, a cave in Mellieha popular among divers. - The cruise then continues to Santa Marija Bay a secluded bay at Comino. - Here we berth for another 90 mins break for swimming or snorkelling. 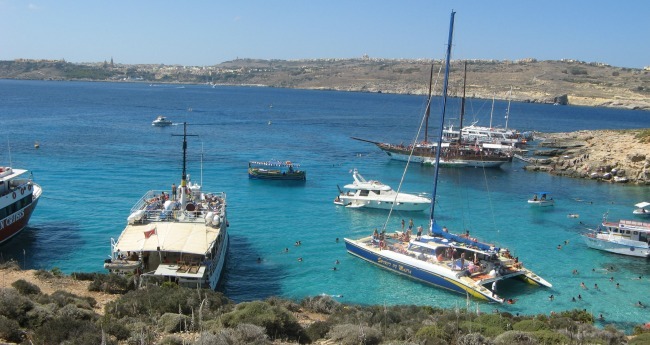 - In the early afternoon we proceed to the magnificent Blue Lagoon in - Comino where we berth for two and a half hours. And other stunning scenic locations that take your breath away. - The M/S Kyumm offers a spacious deck, seating, fully equipped toilets & fresh water showers . - Snacks and hot/cold beverages will be available for purchase a fully-equipped bar. - The M/S Kyumm is fully equipped, licensed & insured by Transport Malta regulations. - All cruises may be cancelled or altered due to weather conditions. 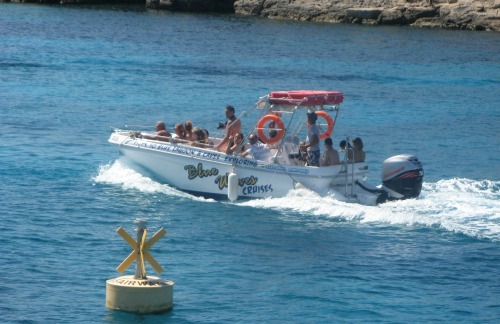 - Passengers in Gozo will be picked up from Mgarr Harbour, to visit Comino & The Blue Lagoon for about 1.5 hours. - The boat will berth at this amazing lagoon with its unique crystal clear waters for one and a half hours to see the tiny island. - Here one is free to either explore the island or to simply enjoy a leisurely swim. - As we sail back to Bugibba, you will view the Elephant Rock (an enormous rock which like an elephant´s head), Santa Marija Cave,Crystal Lagoon and other stunning scenic locations that take your breath away. - A minibus tour will pick up the passengers and visit the historic captial Victoria, Citadella, Ta' Pinu, Xlendi Bay and much more. - Passengers in Gozo will be picked up from Mgarr Harbour, to visit Comino & The Blue Lagoon and rejoin our Turkish Gullet Cruise. Gavdos Star - Full day cruise to Comino. Boat leaves Sliema waterfront at 10.30 am and back leaves at 16.00 hrs. Arrives back in Sliema at 17.30 hrs. Prices: Adults €25.00; Children (5-15) €17.00 and Children under 5 years free. Transport pick up and drop off at any hotel in Malta. Detailed commentary throughout the cruise in Maltese and English. On board facilities; snorkeling equipment, showers, air-conditioned area, full stocked bar and toilet facilities. - The boat departs from Sliema ferries and cruise north. - The luzzu boat passes by Sliema promenade , St. Julian`s Bay , St. George`s Bay , Qawra Bay , St. Paul`s Bay and St. Paul`s Islands and Mellieha Bay to the enchanting island of Comino . - We will stop for approximately 3 hours and 30 minutes inside the crystal clear waters of the Blue Lagoon itself, next to the sandy beach. - Time for swimming , snorkelling , relaxing etc. - After our stop at the Blue lagoon we visit the crystal caves of Comino and cruise back to Sliema . - Visiting the Crysta Caves of Comino at no extra charge. Departing from the Sliema waterfront, the cruise goes straight to Gozo’s Mgarr Harbour which is the main port in Gozo. From there you board a bus for a three hour sightseeing tour around the island. You will visit the Azur window, Inland sea, Fungus rock. Ta’ Pinu Church and Victoria the capital city and the Citadel situated just above Victoria. This was once the old capital city of Gozo. When the tour is over, visitors return to the boat at Mgarr harbour to board and leave to the Blue Lagoon for a 90 minute stay dedicated to swimming, sunbathing and snorkeling. The return journey includes a visit the crystal caves of Comino. Departures every Monday, Wednesday and Friday at 10.00 and return at 15.30. June to October every day. In winter according to weather permitting. Prices Adults €35.00; Children €20.00 including VAT. Trip C – Malta – Comino – Gozo Cruise with minibus. Departures every Monday to Saturday at 10.45 from the Bugibba jetty. Departures from Mellieha bay from the Tunny Net jetty, every Wednesday at 17.45. The boat sails to Gozo Mgarr harbour to enjoy the view of the harbour with the ferry boat sailing in and out of the port. Then sail to the Blue Lagoon for the BBQ night. You can enjoy a dip at sunset whilst the food is being prepared. Later on dancing to disco music with free flowing wine. Returning back to Mellieha bay at around 23.15. 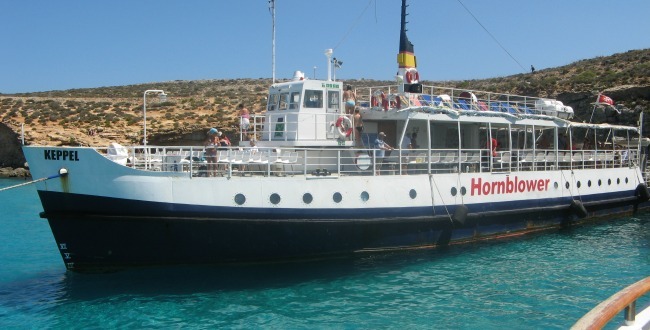 Departure from Mellieha Bay (Ghadira) at 11.00 with Hakuna Matata ll. The captain takes you for a visit along the coast to the different cavern features up to Comino and passing the lagoon on the way. Then on to Gozo crossing the channel between the islands to visit the Mgarr harbour. After that back to the Blue Lagoon for a three hour stop to enjoy swimming, snorkeling and lunch. The boat offers light snacks and cold drinks as well as facilities for showers and toilets. The return trip includes a visit to the caves before proceeding back to Mellieha Bay arriving by 4.30 pm. Daily trips depart from Mellieha bay Tunny Net jetty. Comino Malta cruises is another opportunity to explore the beauties of the Maltese archipelago.